We have garnered a strong position for ourselves in the global market for manufacturing an ayurvedic remedy for the most common disease faced by people these days, i.e. diabetes. 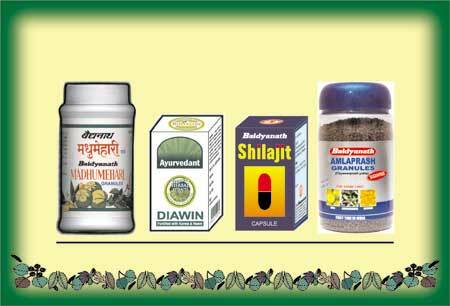 Our Ayurvedic Diabetes Medicines are safe and does not contain nay kind of harmful chemical or steroid. Diawin Tablets : Effective supplements for Diabetics. Helps to relieve complications associated with increased blood sugar like excessive thirst, dry-ness in throat, numbness in hands and feet, blackouts, debility, frequent urination etc. Why take our Ayurvedic Diabetes Medicines?